The government shutdown that started in December of last year caused a lot of chaos across the country. The biggest impact was undoubtedly felt by the estimated 800,000 federal workers who went without pay for a month and a half while the president battled with Congress over the nation’s budget. Beyond furloughed workers, though, nine major federal departments were also affected, largely because of lack of funding. The departments of Agriculture, Commerce, Homeland Security, Housing and Urban Development, Interior, Justice, State, Transportation, and the Treasury were all affected by the government shutdown. The upside of living in our modern, digital age is that the shutdown didn’t have any major impact on application submission capabilities. Sadly, that’s just about the only upside. Application fees support most immigration-related offices, so applications and interviews conducted by the U.S. Citizenship and Immigration Services (U.S.C.I.S.) office and through embassies and consulates were able to continue on apace. U.S. Customs and Border Protection (C.B.P.) personnel are considered “essential,” so border crossings and ports of entry remained open. The biggest closure during the shutdown was also, arguably, the most impactful: almost all scheduled immigration hearings were canceled for the duration of the government shutdown. This is a big concern for a few different reasons. First, there is already a backlog of more than 800,000 immigration cases. Many applicants have already been waiting 2–4 years for their immigration case to be heard and a decision to be made. Now, that backlog has become even more extensive because nearly all of the cases that were scheduled during the shutdown ended up being canceled. That’s an estimated 80,000 immigration hearings that didn’t happen because of the 35-day shutdown — and that’s a conservative estimate. Now, it’s important to note that some immigration hearings did still continue as scheduled. Whether a case was heard or not depended a lot on the region and on the type of immigration hearing needed. Even major cities may have only had a dozen judges working through the shutdown, and many districts in larger metropolitan areas have tens of thousands of hearings scheduled each week — far more than a small handful of judges can handle. This means that the vast majority of immigration hearings are being canceled. Not only that, but those cases aren’t just being postponed temporarily. There’s no space in the hearings schedule to squeeze them in, so those hearings are finding themselves back at the end of the line. Applicants with hearings canceled during the shutdown may be waiting until 2022 for their new court dates. The other key service affected by the shutdown was the E-Verify program. This is a federally-provided program that checks an individual’s right to work in the U.S. In theory, it’s a measure to prevent illegal immigrants from employment without going through the appropriate measures for a visa or permanent residency. However, with E-Verify down “due to DHS appropriations,” employers weren’t able to check new employees during the shutdown. 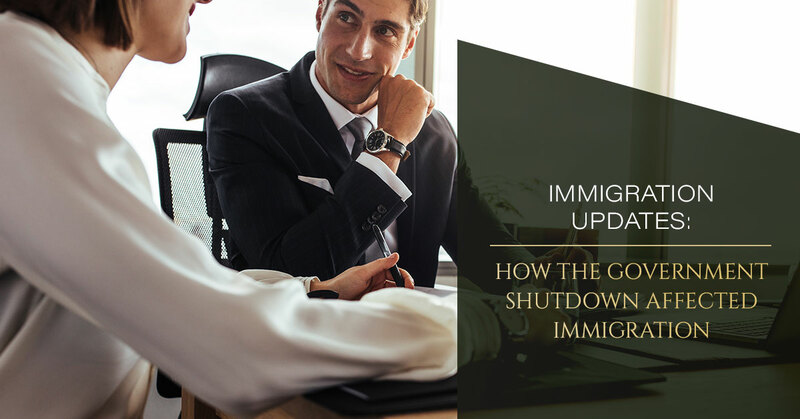 For employers that are required to use the E-Verify system, it meant waiting to hire and on-board new employees until the shutdown was over and they could be checked by the system. Now that the shutdown is over, employers are left scrambling to catch up. If you or a loved one was affected by the shutdown, don’t despair. The knowledgeable, experienced immigration law team at Zohar Law is here to help. If your immigration hearing was canceled, connect with our office to work with an immigration lawyer and learn how to handle your immigration case moving forward. Start by scheduling your consultation with our immigration lawyer team in New York City today.